The organ in St. Magnus in Marktoberdorf (Germany) is looking back on an interesting history. It has been built by the reputed firm Steinmeyer in 1962 for the cathedral St. Lorenz in Nuremberg, where it replaced the previous "Laurentiusorgel", which had been built in 1937 and was destroyed in the war. The organs in St. Lorenz with a total of 162 stops distributed on the Main-Organ, Laurentius-Organ, and Stephans-Organ are the second largest organ installation in Ger­many following Passau cathedral. When it was built in 1962 the new Laurentius-Organ however was considered not strong enough for its intended function and the huge cathedral space, which resulted in several modifications throughout the years. When the complete organ installation in St. Lorenz was renovated starting in 2004, the Laurentius-Organ from 1962 was abandoned and replaced by a new organ from the Klais company. The main organ, also built by Steinmeyer, was restored and kept to a large extent. The Laurentius-Organ as well as the monumental historic main console were rescued from destruction by the Culture and Organ Center of Dr. Sixtus Lampl in Valley, Germany. The organ was sold to Marktoberdorf in 2008, where since then it is filling the St. Magnus church with its beautiful sound. The sound of this organ is colourful and typical for the second half of the past century. A rich palette of foundations creates warmth, while aliquotes and mixtures are providing a radiating crown to the sound. The organ features a very responsive electrical action as well as electrically controlled stops. The console gives evidence of various alterations and is typical for its time. In St. Magnus it is located on a moveable platform on the balcony and connected to the organ via a single wiring harness. The organ is built along the eastern wall of the cross-shaped church and its sound can travel freely into the room. The church has a splendid acoustics with a reverberation time of 3-4 seconds, and the organ can be heard very clearly everywhere in the building. For more information please download the PDF booklet for this sampleset. Please also have a look at the Sample Set Spotlight done by David Lamb on the Contrebombarde website! The sample set has been updated with newly processed samples to achieve a much crisper attack and improved staccato release behaviour (Version number 1.2). The demo recordings also have been updated accordingly. The organ was recorded in 2015 with high end microphones in four-channels. Each pipe was recorded separately with three release layers (staccato, portato, and long notes). The pipes of the Positif have also been recorded with the tremulant turned on. The blower sound was recorded as well, stop and keyboard action noises are only provided for the front channels, since they are almost inaudible at some distance of the pipework. The direct channels have been recorded close to the organ to get a rather dry sound, which is highly suitable for an installation in a room with a good acoustic. The ambient channels were recorded from a position near the center of the nave, from where people would normally here the organ. The recordings have been done in 24bit/96kHz without any analogue filtering. All sample processing steps were performed with our in house developed sample processing tools. 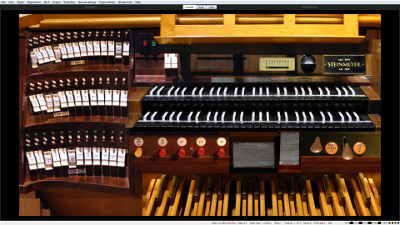 Our custom denoising algorithm is optimized for the charac­teristics of pipe organ samples resulting in a previously unknown quality of the denoising without effecting the pipe speech characteristics. 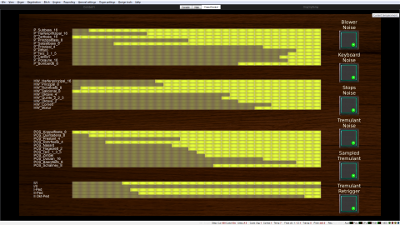 The sample set provides a virtual copy of the instrument with all its original registration aids for the Hauptwerk software. The only exception are the two free combinations available on the real organ, these have been ommitted since Hauptwerk is providing a much more flexible combination system. The only extension with respect to the real organ is an expression pedal for the Positif. The Hauptwerk tremulant is only effecting the Cornett stop, just as on the real organ. 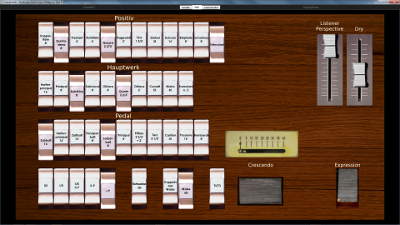 The user interface of the virtual pipe organ consists of various screen pages which are optimized for touchscreen use. The screen pages have been designed with a very high resolution (4972x2772) so that displays with extremely high resolution can be used with maximal quality. The crescendo can be programmed freely by the user, a special screen page is provided for this in the user interface. This page shows the stops as they are engaged at the various crescendo steps. The programming can be changed by clicking on the indicator fields. Buttons to control the blower, keyboards, stops, and tremulant noises are located on this page as well. The settings of these buttons are memorized, so they will be kept when reloading the sample set. The blower noise sample also contains the starting up and stopping phase of the wind supply, so it does take a while after turning it on until the stable background sound is reached. Also worth mentioning are the tremulant options. The tremulant for the Positif stops is available both as sampled and as modelled tremulant (using Hauptwerk's tremulant waveform modelling technique). The sampled tremulant does sound much more natural and realistic, however, the modulation is not synchronized. It also requires extra memory to store the samples. The modelled tremulant on the other hand is synchronized across all pipes, but the sound is not as perfect as the sampled one. The change will become active the next time the tremulant gets switched on. In addition the user can select the retrigger mode for the sample tremulant. When set to "retrigger" the sampled tremulant will also effect currently sounding notes by retriggering them. This will however cause the attack phase of the pipe to sound again. The compression used by Hauptwerk when loading samples is lossfree, i.e. loading samples compressed does not result in any loss of quality. It results however in an increase in CPU load of about 15% during playing. The best quality is obtained when loading the samples in 24-bit resolution, loading in 16-bit will cause a small but noticeable loss of quality. Since these options can be selected for each stop separately it is possible to individually adjust the options to match the available RAM. Approximately 15 GB of free space is needed on the harddisc to install the sample set. §1) This agreement defines the licencing agreement between Pipeloops Reiner Suikat and the user of the sample set of the Steinmeyer organ of St. Magnus in Marktoberdorf. The sample set consists of the samples, images, database, and other files. §3) A licence key is required to fully use the sample set. This licence key is issued by Milan Digital Audio LLC (producer of the Hauptwerk software) and stored on the Hauptwerk dongle. Without this licence only the trial version of the sample set can be used. §4) Any use of this sample set for commercial purposes is not permitted. §5) The customer is allowed to make backup copies of the distribution media as needed. Use of part of the sample set (i.e. samples or graphics) for other products is not permitted. §6) The customer is allowed to resell the sample set. In this case the licence key must be removed from the customer's Hauptwerk dongle and installed on the new customer's dongle. §7) The sample set comes without any warranty. Pipeloops can not assume any liability for the use of the sample set. On this page we collected a number of pieces played on this sample set by various organists to demonstrate the sound and versatility of this instrument. These recordings are available in several formats: "Direct"-channels (dry) only, "Ambient"-channels (wet) only, and all channels mixed set to 50% direct and 100% ambient. All of these are available compressed (mp3) and uncompressed (wave-format) for best possible sound. We would like to thank the performers for their permission to post these works here on our site. In addition Carson Cooman has played a number of more recent pieces which fit this organ dating from 1962 perfectly. Since the use of such recent pieces would need to be licenced from GEMA, I would only be able to post them here at a considerable cost. Hence I am posting a link here to Carsons Website, where he is posting these pieces himself. Many thanks for this support! Again we are offering you the possibility to thoroughly evaluate this sample set before a purchasing it. We are still the only producer giving the customer full access to all samples and functions of our sample sets before actually buying it. This sample set fatures the same advanced testing option we introduced with the Oberlinger organ (Bonn-Beuel): You can test the set with all stops, but with the periodic muting of the sound known from our other sample sets, but also play with a small number of stops without any interruption for as long as you like. As long as not more than five stops are drawn, the interrupt timer is disabled and you can play continuously. As soon as you draw more than five stops, the periodic muting of the sound is switched on. This gives you the best evaluation options currently available for any sample set that we know of. Detailed installation instructions for your Hauptwerk version are given in the Hauptwerk Main User Guide. This can be called up from Hauptwerk at any time via the Help­ menu. You can choose to receive this sample set on a set of 3 DVDs or as downloadable files (appr. 10 GB). During the installation a dialog will appear displaying the licence agreement for this sample set, which you can also find in this booklet. You must accept this agreement in order to continue with the installation. The full version of the sample set requires a lience key issued by Milan Digital Audio LLC, the owner and producer of the Hauptwerk software. You will receive a mail shortly after your purchase with all information required to get and install the key on your system. Without this licence update you will only be able to install and run the trial version of this sample set. If you want to install the full version after your purchase and you already have the trial version installed, please avoid to uninstall the trial version, as Hauptwerk will remove all your configuration and voicing data for this organ in that case. Here you can find the downloads for this sample set. For the trial version you will need to download disks 1-3. For the licenced version you also need the "licencedODF" file, which does however require the dongle licence upgrade to be placed on your Hauptwerk dongle, before you can install it in Hauptwerk. Download links: disk1, disk2, disk3, licencedODF.